I have long been a fan of Star Trek, from the original series, Next Generation and the movies, although I have never seen The Final Frontier, hearing that it is extremely bad. One day I will have to watch it to make up my own mind about it. When Star Trek was relaunched in 2009, it brought new actors, and new energy to the franchise while at the same time redoing the entire Star Trek universe. The characters were so well done and very true to the original series, it was hard not to get excited about the next one. That next one opened this week. 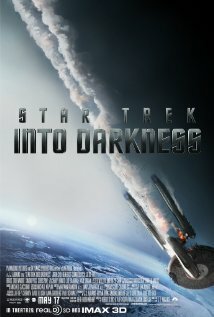 Star Trek Into Darkness is quite the ride. It is the characters and story which carry a movie and once again the actors here bring their characters alive and the story is so good. The movie is so well done, funny, sad, tense and totally action packed. There are a few surprises and twists along the way that I am glad I did not hear about ahead of time and surely will not give away here. The special effects are so well done and I did not see it in 3D. As I have never seen a movie in 3D, I did not want the 3D effect to distract me from the story. I will be going back though to see it again in IMAX 3D format, in fact for a fleeting moment, I thought about just heading straight to the box office and buying a ticket for the next 3D showing. I've never seen the same movie, the same day, at a theater before...and no I didn't. It`s definitely worth seeing and I give it a 9.5/10.